This German organization with international outreach was my longest employer. I spent about four years (1993-96) working as Programme Coordinator at its Islamabad office at Number 2, Main Margalla Road, Sector F/6-3. Founded in 1967, and headquartered in Munich, Germany, the Foundation's work is concentrated at two levels - within Germany itself and across the globe. Presently, the Foundation has over 90 development programmes and projects in over 50 countries in Asia and the Pacific, the Middle East, Africa, Latin America and Eastern Europe. Working in the spirit of Christian humanism, it's guiding principle is "in the Service of Democracy, Peace and Development". It pursues this through activities which are aimed at strengthening governance and administrative in public-sector institutions, and promoting civil society, democracy and the rule of law. To visit the Foundation's website click here. 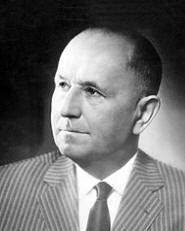 The Foundation's name comes from the late Prime Minister of the state of Bavaria, Mr. Hanns-Seidel (1901-61). In the course of his illustrious post-World War II political career, Mr. Seidel (see photo on the right) served, among other duties, as the Economics Minister of the State of Bavaria and Chairman of the Christian Social Union, and has been called the "architect of modern Bavaria". The Foundation is one of Germany's five "political foundations" (the others being the Konrad-Adenauer Foundation, Friedrich-Ebert Foundation, Friedrich-Naumann Foundation and Heinrich Boell Foundation). Each of these foundations is ideologically and financially closely affiliated with a political party represented in the German Bundestag or federal parliament - of which there are five - and their activities in Germany and in the countries where they have programmes/projects tends to closely reflect this ideological link. For example, the Heinrich-Böll Foundation, which is affiliated with the environmentalist party "Die Gruenen", usually prioritizes projects relating to the environment, while the Friedrich-Ebert Foundation, which is affiliated with the party of the German Social democrats, often involve itself in activities closely related to labour and manpower issues, and the Friedrich-Naumann Foundation, which is affiliated with the German Liberal Party, would emphasize human rights and gender equality programmes and projects. The Hanns-Seidel Foundation is affiliated with the conservative Christian Social Union, which for decades is the ruling party in the large and prosperous southern German state of Bavaria, and a junior partner of Germany's largest political party, the Christian Democratic Union, with which it has shared the reigns of power at the federal level for decades. The Hanns-Seidel Foundation advocates self-responsibility and free development of the individual while emphasizing social responsibility and solidarity. Its services are accessible to persons irrespective of their party affiliation. In the many countries where it runs programmes/projects, the Foundation strives to promote civic education and an understanding and appreciation of the importance of democracy, the rule of law and good governance, and to support development schemes for the benefit of the poor, and institution building in both the governmental and non-governmental sectors. Funding for its many activities is provided by the German federal government through its Ministry for Economic Cooperation and Development, the state government of Bavaria, private sponsors and from fees it collects for participation in events and other activities it organizes. The Foundation's performance is, to put it mildly, impressive. Just last year (2005) the Foundation organized in its 54 host countries 7000 events (conferences, seminars, workshops etc.) in which about 170,000 persons participated. In Germany, the Foundation held about 1500 seminars at which some 50,000 persons participated. Financial support in the form of stipends for higher education were given to 500 persons. The Foundation's presence in Pakistan goes back to the early 1980's when the late Bavarian Prime Minister, Franz-Josef Strauss, visited the country and was requested to promote cooperation with it by General Zia-ul-Haq, who was Pakistan's President at that time. Subsequently, with the Foundation's managerial, technical and some financial input, a project to establish a technical training center at Loralei was initiated in cooperation with the provincial government of Baluchistan's Labour and Manpower Division. The Center's purpose was to impart technical training to unemployed youth in the region with a view to enhancing their skill levels and consequently, their employment prospects and entrepreneurial opportunities. German experts worked at this Center for many years and the project was ranked overall as highly successful. In early 1993, seeking to expand on its cooperation with Pakistan, the Foundation pushed ahead with preparations to establish an office in the Islamabad. 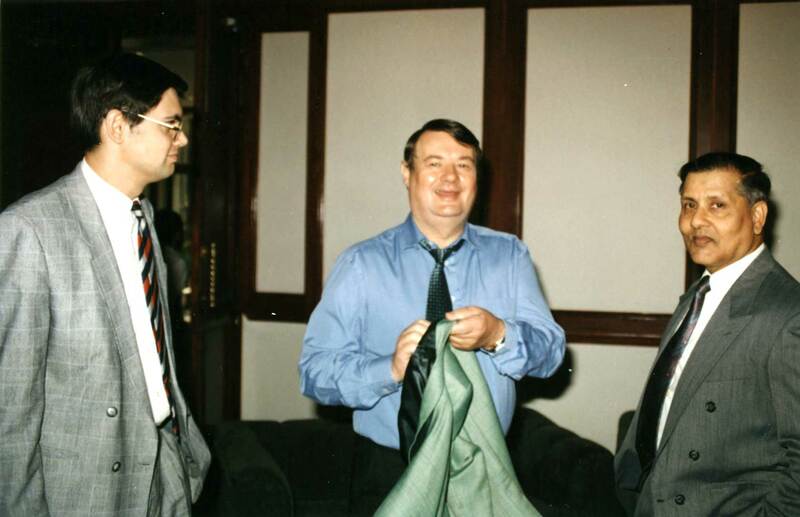 The task was entrusted to Dr. Hein Kiessling, a highly experienced and flexible practitioner with many years of service on international assignments in the Asia-Pacific region to his credit, and a man widely regarded in the organization as competent enough to successfully handle the complex and challenging task of setting up a new office under difficult circumstances. By chance, an associate of mine, who had met Dr. Kiessling and was aware of his plans to recruit staff, called me up and told me to visit him at his newly acquired office premises. Following that advice, which I can say was one of the best I've received, I went there and after some discussion was offered the post of Programme Coordinator which I accepted. My work at the Foundation formally commenced on 1st April 1993. I worked for it until the 31st December 1996. In Islamabad, the Foundation runs an "institution-building and management training programme" which, broadly speaking, aims to provide training support to federal parliamentary officials and improve federal parliamentary support structures, and undertake joint collaborative measures with various higher educational establishments, research institutes and non-governmental organizations. The Foundation has a number of local project partners and more detailed information can be got here. Dr. Kiessling (standing to my right in the middle of the enlargeable photo on the left) retired in 2001 and presently resides in Munich. Though I still live and work in Islamabad, I rarely visit the Foundation's office now, but the scope of its work ten years down the line has not changed much. 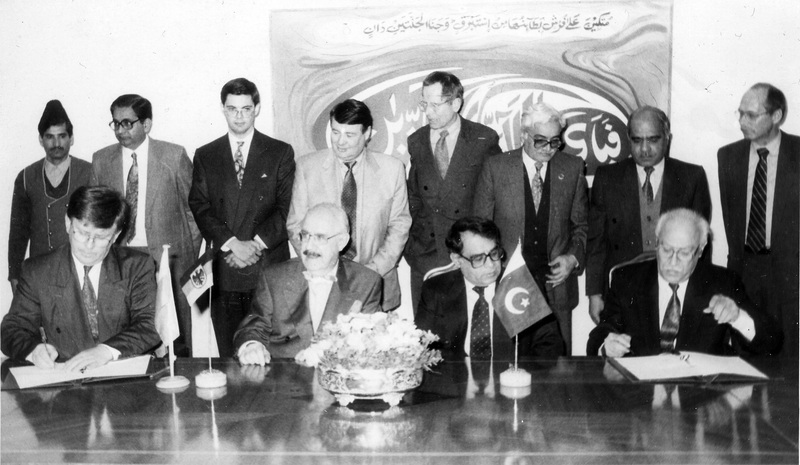 In my time, the Foundation worked with the administrations of Pakistan's federal parliamentary institutions: National Assembly and Senate (the enlargeable photo on the right was taken on the occasion of the signing of the cooperation agreement between the Foundation and the federal parliamentary administrations in Islamabad). Some of the measures which the Foundation implemented for them included arranging study visits for senior parliamentary officials to German parliamentary institutions in Bonn, Berlin and Munich, funding the purchase and installation of a closed circuit television system in the National Assembly hall, and holding joint conferences and seminars. Other project partners were the Institute of Strategic Studies (which I joined after leaving the Foundation at the end of 1996), the Area Study Centre for Europe at the University of Karachi and the Area Study for Central Asia at the University of Peshawar, and the non-governmental organizations Foundation for Research on International Environment, National Development and Security (FRIENDS) and the Islamabad Council on World Affairs. Our relationship with these project partners was confined primarily to holding joint national or international conferences, seminars and workshops (most of these national and international events were held with FRIENDS), and occasionally providing them with equipment such as computers, photocopying machines etc. to improve their operational efficiency. As the Foundation's Programme Coordinator, I sure had a plenty of work to do. My main responsibility was to organize the numerous international events the Foundation jointly and frequently undertook in cooperation with its parter organization, notably FRIENDS and the Area Study Centre at the University of Karachi. A complete listing of these along with other information is contained in my events section. My other responsibilities included liaising regularly with the project partners, correspondence, assisting in the writing of the annual report for the Foundation's headquarters in Munich, occasional translation of German texts into English, receiving, briefing and counselling visitors, assessing proposals for cooperation submitted to the Foundation by other non-governmental organizations and by professionals, and coordinating with Siemens Pakistan for the installation of the closed circuit television system in the main hall of the National Assembly of Pakistan. In the Resident Representative's absence, which was usually in mid-Summer every year and for two months duration, I took on the role as Acting Representative. In hinsight, I can state that my work at the Foundation was really demanding, challenging and often frustrating at times, but now ten years later, I am grateful both to it, and especially its highly professional and caring Resident Representative Dr. Hein Kiessling, for his mentorship and for giving me the opportunity to work for such a committed and noble organization, which I shall always hold in the highest personal regard.